Did Hedge Funds Drop The Ball On Yandex NV (YNDX) ? Yandex NV (NASDAQ:YNDX) investors should be aware of a decrease in activity from the world’s largest hedge funds in recent months. Our calculations also showed that YNDX isn’t among the 30 most popular stocks among hedge funds. Let’s take a peek at the key hedge fund action surrounding Yandex NV (NASDAQ:YNDX). What does the smart money think about Yandex NV (NASDAQ:YNDX)? At the end of the fourth quarter, a total of 23 of the hedge funds tracked by Insider Monkey held long positions in this stock, a change of -38% from the second quarter of 2018. 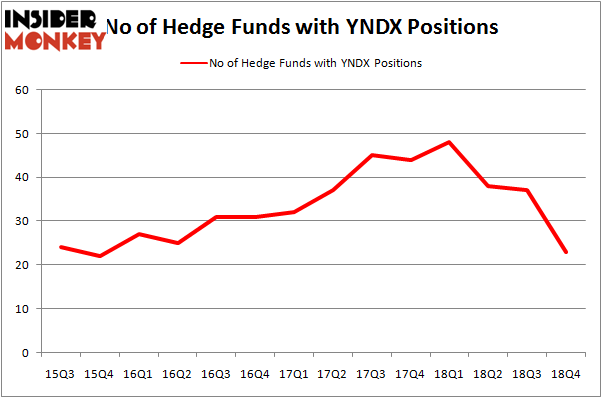 The graph below displays the number of hedge funds with bullish position in YNDX over the last 14 quarters. 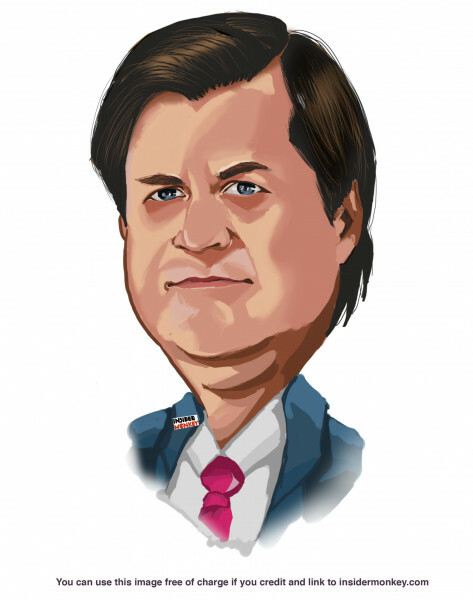 With the smart money’s sentiment swirling, there exists an “upper tier” of notable hedge fund managers who were upping their stakes considerably (or already accumulated large positions). More specifically, Cadian Capital was the largest shareholder of Yandex NV (NASDAQ:YNDX), with a stake worth $152.2 million reported as of the end of September. Trailing Cadian Capital was Hound Partners, which amassed a stake valued at $113.9 million. Lakewood Capital Management, Light Street Capital, and Kora Management were also very fond of the stock, giving the stock large weights in their portfolios. Because Yandex NV (NASDAQ:YNDX) has witnessed bearish sentiment from the entirety of the hedge funds we track, it’s easy to see that there exists a select few funds that elected to cut their full holdings last quarter. It’s worth mentioning that Scott Ferguson’s Sachem Head Capital sold off the biggest investment of the 700 funds monitored by Insider Monkey, worth an estimated $142.6 million in stock. Daniel S. Och’s fund, OZ Management, also cut its stock, about $87.6 million worth. These transactions are intriguing to say the least, as total hedge fund interest dropped by 14 funds last quarter. Let’s check out hedge fund activity in other stocks similar to Yandex NV (NASDAQ:YNDX). We will take a look at HollyFrontier Corporation (NYSE:HFC), Everest Re Group Ltd (NYSE:RE), TechnipFMC plc (NYSE:FTI), and Lennox International Inc. (NYSE:LII). All of these stocks’ market caps match YNDX’s market cap. As you can see these stocks had an average of 24.25 hedge funds with bullish positions and the average amount invested in these stocks was $452 million. That figure was $515 million in YNDX’s case. Everest Re Group Ltd (NYSE:RE) is the most popular stock in this table. On the other hand TechnipFMC plc (NYSE:FTI) is the least popular one with only 21 bullish hedge fund positions. Yandex NV (NASDAQ:YNDX) is not the least popular stock in this group but hedge fund interest is still below average. This is a slightly negative signal and we’d rather spend our time researching stocks that hedge funds are piling on. Our calculations showed that top 15 most popular stocks among hedge funds returned 21.3% through April 8th and outperformed the S&P 500 ETF (SPY) by more than 5 percentage points. A handful of hedge funds were also right about betting on YNDX as the stock returned 30.7% and outperformed the market as well.